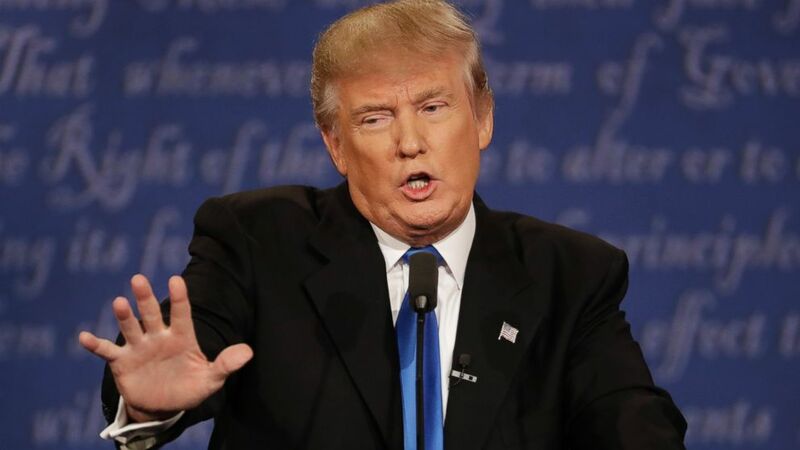 NEW YORK CITY -- Donald Trump's income tax returns from 1995 reportedly show he declared a $916 million loss, according to the New York Times, which said it received three pages from Trump's filings that year. The Times posted three pages it said were from Trump's New York, New Jersey and Connecticut state income tax filings from 1995, all of which declared a loss of $915,729,293. The documents came to the newspaper by mail, with a New York City postmark, the Times reported. The paper said the legitimacy of the documents was confirmed by Jack Mitnick, a lawyer and certified public accountant who handled Trump's tax affairs until 1996 and who was was listed as the preparer on the New Jersey tax form. Hillary Clinton has used Trump's failure to release his tax returns as part of her attack on him, most recently at the debate Monday evening. When Clinton alleded to Trump possibly not paying any taxes, Trump said that made him "smart." His campaign responded to the Times story by saying in a statement that did not confirm or deny the validity of the documents the Times posted, saying "The only news here is that the more than 20-year-old alleged tax document was illegally obtained." "Mr. Trump is a highly-skilled businessman who has a fiduciary responsibility to his business, his family and his employees to pay no more tax than legally required," the statement said. "That being said, Mr. Trump has paid hundreds of millions of dollars in property taxes, sales and excise taxes, real estate taxes, city taxes, state taxes, employee taxes and federal taxes."